Škoda has renewed its sponsorship of the Tour of Britain, once again becoming the official vehicle sponsor. The partnership deal is a repeat of last year’s popular ‘Škoda King of the Mountains’ climbs, three of which will take place on each stage of the race, from Sunday 9 September to Sunday 16 September 2012. Škoda has a long association with cycling, dating back to the start of the company in 1895 when the founders Vaclav Laurin and Vaclav Klement began manufacturing bicycles in their home town of Mlada Boleslav in the Czech Republic. As Official vehicle sponsor to The Tour of Britain, Škoda UK will supply a 50-strong fleet of vehicles made up of Superbs, Octavias and Yetis. The cars will guide participating riders across 850 miles of roads through England, Scotland and Wales as they compete in the UK’s biggest professional bike race. Škoda UK will also be providing support vehicles to The Halford’s Tour Series, an eleven round city centre cycling race series. The Series begins in Kirkcaldy, Fife on Tuesday 15th May. Jonathan Durling, of Skoda’s sponsorship department, comments: "We’re very proud of our firm’s heritage in cycling and our continued partnership with The Tour of Britain gives us the exciting opportunity to be a part of the UK’s leading professional bike race. 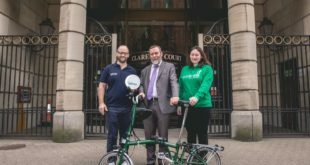 Our vehicles are solid, safe and reliable and I am confident they will offer strong support to participating cyclists clocking up the miles across England, Wales and Scotland."